Another week and another make-ahead dinner prepped, portioned and stored in the fridge for use during the week. I'm so weirdly proud of myself when I actually do these. 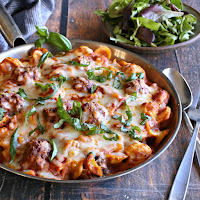 This week's Italian style casserole is so simple and so tasty that it's just crazy not to make it at least once a month. 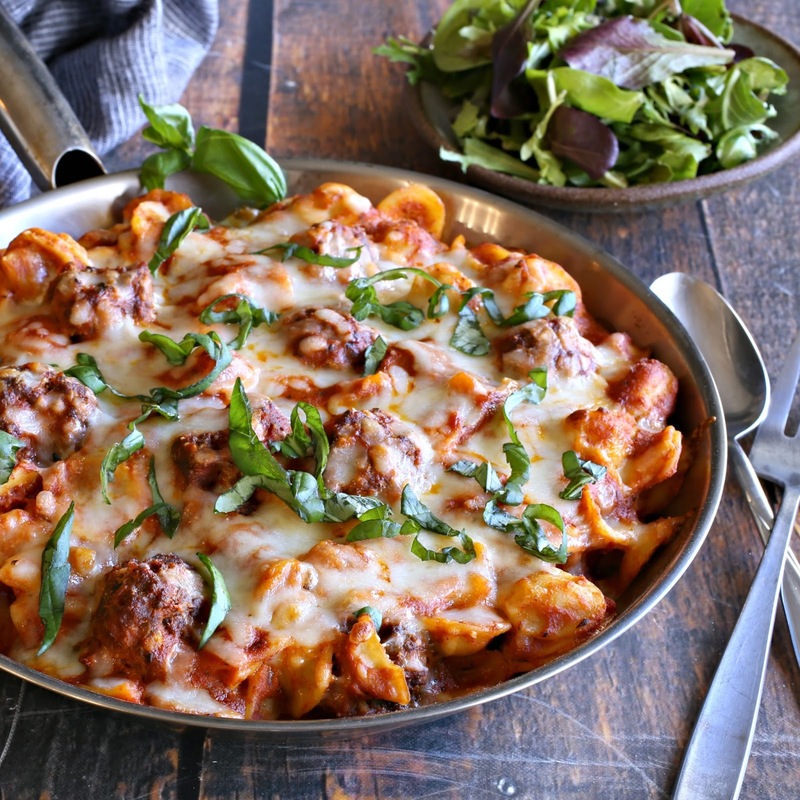 Pasta, sauce and juicy little meatballs baked with cheese. How good does that sound? I serve it with a salad and a side of steamed broccoli and it's worth looking forward to all day. My secret to the juicy and super flavorful meatballs is not only the ingredients that go into them but also the method. A quick 15 minutes in the oven firms them up enough so that they won't fall apart in the sauce but doesn't dry them out. 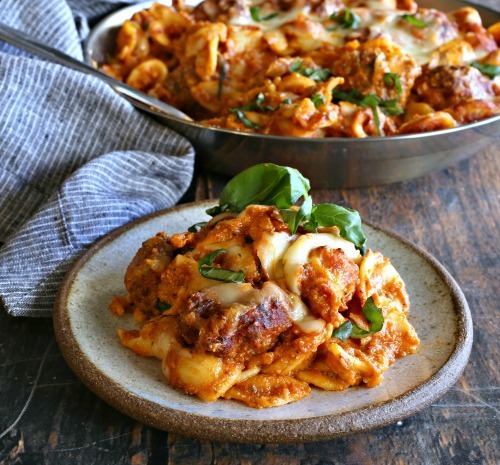 As they finish cooking in the marinara, they take on additional flavor and become super tender. Feel free to use your favorite marinara sauce recipe but, honestly, I find there are so many great, all natural jar sauces these days that I'm more than happy to take the shortcut. This recipe can also easily be doubled if you're feeding a crowd larger than mine. Enjoy! 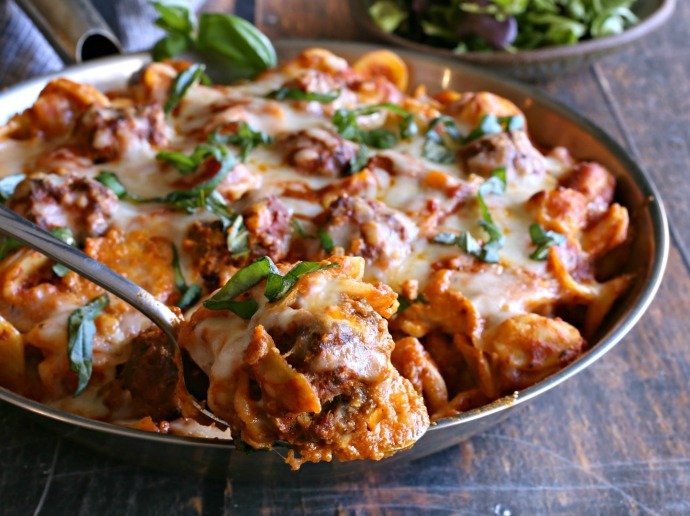 Combine the ground beef, egg, onion, garlic, breadcrumbs, Parmesan cheese, milk, basil, oregano, salt and pepper in a large bowl. Scoop meatballs (I used a 1 oz. scoop) onto a baking sheet lined with parchment paper and bake in the oven for 15 minutes. Heat the marinara sauce in a large pot on the stove. When the meatballs come out of the oven, add them to the sauce, cover, reduce the heat to low and simmer for 30 minutes. Cook the pasta in boiling salted water according to package directions. Drain and stir in the ricotta cheese. 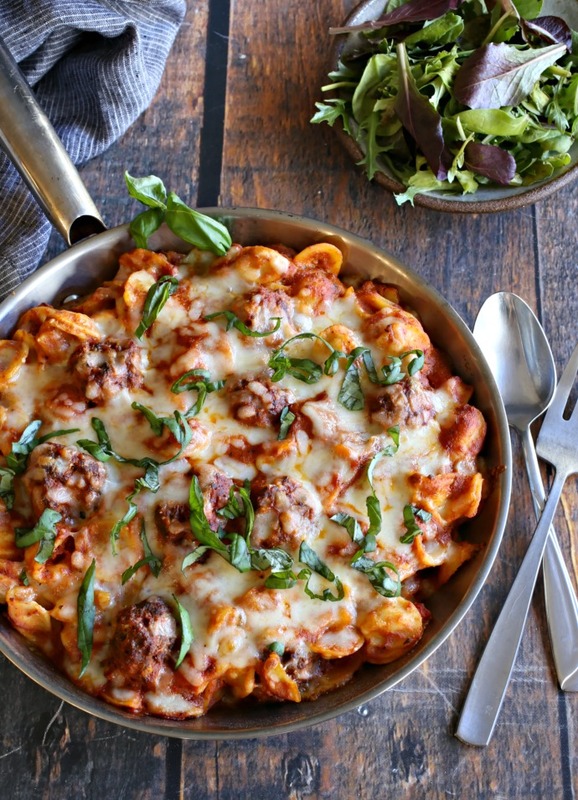 Add the pasta to the meatballs and sauce and spoon everything into a large baking dish or large, oven-proof pan. Top with the mozzarella cheese and bake at 400 degrees for 15 - 20 minutes or until the cheese has melted. Serve with additional Parmesan cheese on top. That's it. I'm coming back to NY and eating at your place.